OHSWEKEN, Ont. (July 20, 2018) – One of the most anticipated nights of the year saw a full pit area and busy grandstands on Jibs Action Sports Christmas in July and Autograph night at Ohsweken Speedway on Friday, July 20. Fans brought dozens of new, unwrapped toys in support of the track’s Christmas in July toy drive to help bring Christmas to local underprivileged children in December. Unfortunately, mother nature intervened on the night and prevented any Feature races from taking the green flag as heavy rain fell during the final B-Main race of the night. A total 132 drivers were signed in across four divisions, headlined by the invading Patriot Sprint Tour versus the Kool Kidz-Corr/Pak 360 Sprint Cars, which saw 37 360 Sprint Cars registered for the $3,333-to-win event. Prior to the rain, Jake Brown of Brantford, Ont., Mack DeMan of Mississauga, Ont., Scott Kreutter of Alden, NY and Cory Turner of Caistor Centre, Ont. won qualifying heats to start the night while Jordan Thomas of Harding, PA recovered from a heat race rollover to win the first B-Main while and Ryan Turner of Caistor Centre, Ont. won the second B-Main. During the heats, several drivers had major issues. Jim Porter and Scott Burke both got upside down in heat one before Dylan Westbrook saw the engine expire on his No.47x in heat two. In the third heat Thomas got over the banking and drove hard into the turn three bales before rolling on his side. The fourth heat ran caution-free. Provisional starting spots were awarded to Steve Glover and Dylan Westbrook as the top non-qualified Patriot Sprint Tour and Kool Kidz-Corr/Pak 360 Sprint Car drivers based on points. With all preliminary races and qualifying completed, the field was set for the 25-lap Feature. Matt Billings of Brockville, Ont. and Alex Hill of Six Nations, Ont. pulled front row starting spots after qualifying into the redraw for the top-11 drivers in passing points who also finished in the top-five in their heat. As a result, the Feature has been rescheduled and added to the Burger Barn Night Before the Canadian Sprint Car Nationals on Friday, September 14. In the Strickland’s GMC Crate Sprint Car division, Ryan Hunsinger, Caleb Wood and DJ Christie won qualifying heats earlier in the night while the B-Main was rained out with three laps complete. The B-Main and Feature will be completed on a date still to be determined. Blake Bomberry Jr., Billy Bleich and Christopher Hale won the qualifying heats. When the rescheduled Feature is run on a still to be determined date, Jay Liverance and Mike Klazinga will lead the field to the green flag. For the HRW Automotive Mini Stocks, Gillian Hils and Nick Masi entered Friday’s race tied at the top of the point standings and it will stay that way for another week. Before the rain, Jason Dixon, Jonathan Ayrton, Jon Janssens and Matt Nuell won the four qualifying heats while B-Main victories went to Patrick Abrahamsson and Sean Iftody. When the Feature is rescheduled, Jason Dixon and Paul Longboat will lead the 28-car field to the green flag. Ohsweken Speedway returns to action on Friday, July 27 for Pinty’s Delicious Food Hot Rod Night. Fans will receive discount admission when they arrive with their classic car or motorcycle. 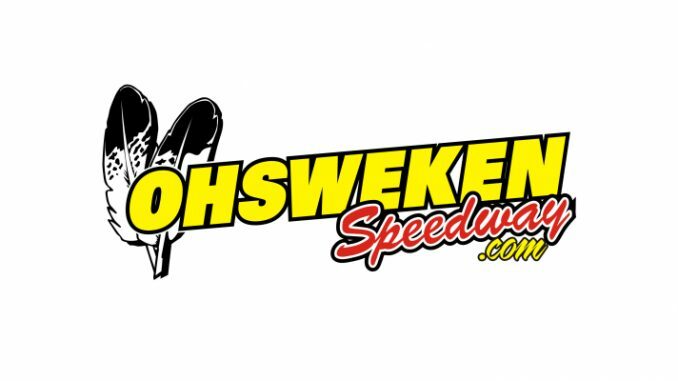 All four Ohsweken weekly divisions will be in action, including the Kool Kidz-Corr/Pak 360 Sprint Cars, Strickland’s GMC Crate Sprint Cars, Middleport Mechanical Thunder Stocks and HRW Automotive Mini Stocks. Race time is 7:30pm and adult admission is just $14 and children 12 and under are $3 or less. For additional event information, visit www.ohswekenspeedway.ca. 6. 24 Blake Bomberry Jr.
12. 108 Billy Bleich Jr.
18. 38 Frank Turkey Jr.
28. 108x Billy Bleich Jr.